Milk Chocolate Foil Turkey - 3/8 oz. Candy Corn - 1.45 oz. Chocolate Turkey - 1 oz. Fall Oreo - 1 oz. Thanksgiving Oreo - 1 oz. 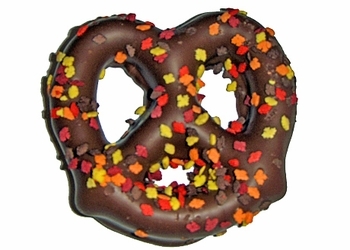 Fall Jumbo Pretzel - 1 oz. Peanut Butter Polka Dots Pretzel - 2 oz. Milk Chocolate Apple - 2 oz. Jelly Belly Autumn Mix - 5 oz. Chocolate Basket with Fancy Jelly Pumpkins - 4 oz.